Naphthalene is in solid state at any temperature below its melting point. The particles are very closely packed together in an orderly manner. The forces between the particles are very strong. The particles can only vibrate at a fixed position. As the naphthalene is heated, heat energy is converted to kinetic energy. Kinetic energy increases and the molecules vibrate faster about their fixed positions and the temperature increases. Naphthalene is still in solid state. Naphthalene molecules have received enough energy to overcome the forces of attraction between them. Some of the particles that gain enough energy begin to move freely. Naphthalene starts to melt and changes into a liquid. Naphthalene exists in both solid and liquid states. The temperature remains constant because the heat that supplied to naphthalene is used to overcome the forces of attraction that hold the particles together. 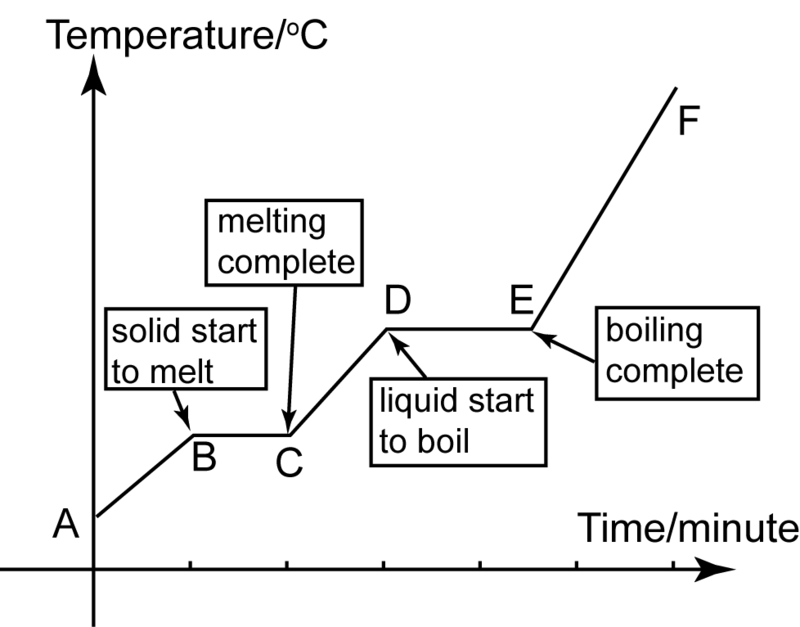 The constant temperature is called the melting point. The heat energy that absorbed to overcome the intermolecular forces is named as the latent heat of fusion. All the naphthalene has completely melted. Solid naphthalene has turned into liquid. Naphthalene is in liquid state. As the liquid naphthalene is heated, the molecules gain more heat energy and the temperature continues to increase. The particles move faster and faster because their kinetic energy is increasing. Naphthalene still exists in liquid state. Naphthalene molecules have received enough energy to overcome the forces of attraction between the particles in the liquid. Some of the naphthalene molecules start to move freely and liquid naphthalene begin to change into gas. Naphthalene exists in both liquid and gaseous states. The is because the heat energy absorbed is used to overcome the intermolecular forces between the particles of the liquid rather than increase the temperature of the liquid. This constant temperature is the boiling point. All the naphthalene has turn into gas. The gas particles continue to absorb more energy and move faster. The temperature increases as heating continues.